The powerline technology takes advantage of your building's existing electrical wires to transfer data while simultaneously transferring traditional power. That means, instead of Ethernet cables or wireless signals, Powerline routes network traffic through your home's electrical wiring, extending your network. Powerline adapter speeds range from 200Mbps used for moderate traffic, up to streaming a high-def video signal from a computer, a network attached storage (NAS) or a connected HDTV. High performance adaptors with a speed of 500 Mbps are ideal for AV applications such as multiplayer gaming, streaming multiple HD or 3D videos or IPTV simultaneously. 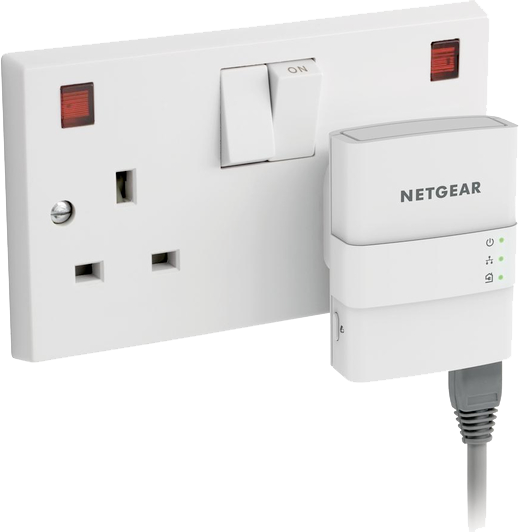 Netgear powerline adapters supporting the HomePlug AV standard are fully compatible with any other brands supporting this standard. Depending on the model Netgear powerline adapters are featured with a convenient extra outlet (PassThru). One or more devices are out of range. Powerline extends your network to devices outside the range of your existing Wi-Fi signal or Ethernet wiring. Your network can reach devices throughout your home. If you need to extend an existing Wi-Fi network to an area where the signal strength is too low, e.g. basement or terrace the solution is a powerline Wireless N Extender. In this case, powerline carries network traffic to the wireless extender — and your dead zone becomes a hot spot. Just plug the extender into the wall, enter the appropriate settings, and you're done. How do i setup my Wireless Network? Plug the first adapter into the power outlet and connect it via the network cable with you router. Press the encryption buttons on both adapters and you're done! Powerline - Enjoy wired speeds in any room!